You become what you think. If you believe you can do something you probably will. The moment you stop believing in yourself is the moment your quest will end. Positive thinking comes easily for some people but must be worked at for others. Positive thinking people are happier, healthier and more successful. Life is more fun. Learning occurs continuously and helps make you a better person. I monitor my self-talk and can turn negative thoughts into positive ones. Surround yourself with people who make you a better person, those with positive thinking and attitudes. You talk to yourself throughout the day and most of the time you aren’t even aware. Monitor your self-talk. Most beliefs can be changed. 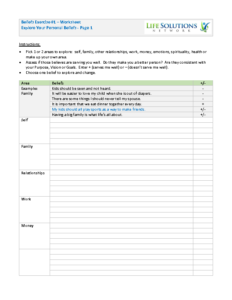 Maintain a journal of your self-talk for one or more of your typical days. How much is positive? Practice various techniques and find one that works for you, e.g. monitoring self-talk, affirmations or visualization. Develop an understanding of your emotions and their underlying beliefs. Practice finding and substituting positive beliefs. Visualization. This is a mental technique that uses the imagination to make dreams and goals come true. By visualizing a certain event, situation, or an object, you attract it into our life. Know Your Beliefs. This is one of the Dreambook pages. Keep track of your personal thoughts over the next week. How many are negative and how may are positive? Ask yourself if a positive belief can be substituted for a negative one. Example: I am stuff in traffic and feeling stressed. My negative belief is that I’m late or wasting my time. A substituted positive belief might be to think that this is a good time to enjoy some peace and quiet by listening to music. I’ve never done it before. It’s an opportunity to learn something. When I stop to listen to the voice in my head, “what do I hear”? What aspect of your life is most important right now? How can a positive attitude help you? Self-talk. Mental talking: the things that an individual says to himself or herself mentally. Affirmation. A positive statement or declaration of the truth or existence of something.